The National Museum has its setting in one of the oldest buildings in Florence and one of the most beautiful in Italy, which was begun in 1255. Initially the headquarters of the Capitano del Popolo and later of the Podestà, in the sixteenth century it became the residence of the Bargello or head of police spies from which it took its name. Throughout the eighteenth century it functioned as a prison. It has been the setting of many of the most important events of civic life such as the meeting place of the Council of the Hundred in which Dante took part. There have been sieges, fires and executions, the most famous perhaps being that of Baroncelli, involved in the Pazzi conspiracy against the Medici in which Leonardo also participated. Despite a series of alterations and additions which altered the original plan during the fourteenth and fifteenth centuries, the palace preserved its pleasant severity, best seen in the beautiful courtyard, the balcony and the large hall on the first floor. The building's use as a National Museum began in the mid-nineteenth century, and nowadays is the setting mainly for works of sculpture and many examples of the decorative arts. What the Uffizi offers in painting, the Bargello offers in sculpture and its courtyard and interiors contain some of the masterpieces of the Tuscan Renaissance. In the large fourteenth century hall on the first floor are found some of the finest works of Donatello (1386-1466) such as the marble Youthful David, the St. George from its niche in Orsanmichele and the later, and more ambiguous, David in bronze. All are works in which the linear and decorative tendencies of late Gothic sculpture can be seen giving way to more solid and human ideals, full of civic and moral dignity. 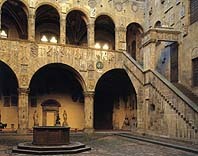 Close to the work, of Donatello are exhibited sculptures by his pupils Desiderio da Settignano (c. 1430-1464) and Antonio Rossellino (1427c. 1479), and the two panels entered by Lorenzo Ghiberti and Filippo Brunelleschi for the Baptistery Doors competition of 1401. Among the more dazzling exhibits are the glazed terracottas of Luca della Robbia (c. 1400-1482), whose sweet Madonnas glitter in white and blue as bright as the day they left the studio. For the more important fifteenth century sculptors, the portrait bust provided the means of penetrating beyond surface appearance to the human character, and the second floor houses a collection of such portraits of notable Florentines. In the recently refurbished ground floor room are exhibited works of the sixteenth century Tuscan masters, among them sculptures by Michelangelo (1475-1564) , Bacchus, the circular relief the Madonna and Child, the Brutus and the David-Apollo. Then follows the work of Ammannati (1511-1592), Bandinelli (1488-1560), Andrea and Jacopo Sansovino (1460-1529 and 1480-1570). Cellini is represented by the little model for the Perseus and by the small bronze sculptures brought from the Loggia of Orcagna, and Giambologna (1529-1608) of whom Mercury can be admired and on the loggia the delightful bronze animals made for the garden of the Medici Villa of Castello. The museum houses many more treasures in cluding Carrand, Reissmann and Franchetti donations augmenting the decorative and minor art collections displayed in the many rooms of the Palace, on the first and second floors. From ivories, including precious examples also of the Roman and Byzantine periods to medieval and Limoges enamels, French and German gold works, Renaissance jewellery, Islamic examples of damascened bronze, some from grand-ducal collections, Venetian glass, the museum displays its treasures among which extremely rare panel pieces and wooden sculptures. Very important too is the collection of maiolica, arms and small bronze sculptures. Moreover the second floor contains, in two rooms, the Della Robbia section works of Andrea and Giovanni Della Robbia, Verrocchio (a bronze of David and Lady with Posy) and the splendid Medici collection of medals, recently reopened to the public, with Baroque sculpture.